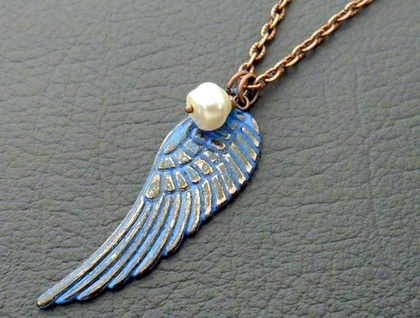 A detailed angel wing pendant, hand-patinated and distressed for an aged look, is accented by a cream-coloured glass pearl. 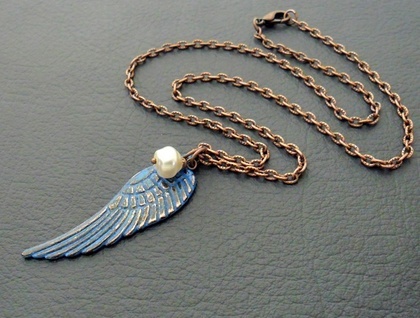 The angel-wing pendant is copper based, and has been hand patinated by another artisan using a special mix of chemicals. I decided that I wanted a more distressed, vintage look, so I scrubbed off some of the patina using super-fine steel wool, revealing coppery highlights underneath the blue patina. Then I sealed the wing with clear varnish to preserve the new finish. The glass pearl resembles a freshwater pearl, in a shape called 'baroque': a rounded, asymmetrical shape, with a swirl to it like a seashell's. 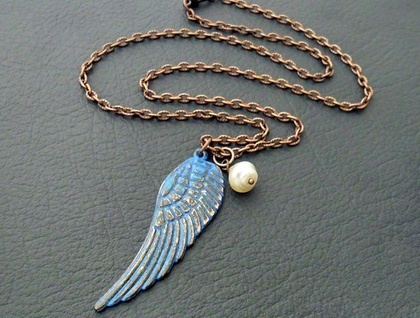 The chain is iron based and antiqued-copper in colour, with textured, oval links. The necklace fastens with an antiqued-copper coloured lobster-claw clasp. 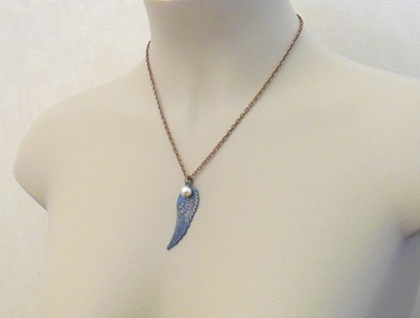 The 'Rusty Blue Wing' necklace measures 48.3cm, including the lobster-claw clasp and the ring, while the angel wing pendant measures 50mm lengthwise (including the little hanging loop at its top), and 17mm across at the widest point. The little imitation pearl is 8mm across. If you would like an extension chain, or a different length of chain, just leave a message in the ‘notes for silverlight’ field when you check out of Felt, stating what you would like. Such alterations can be made at no charge.